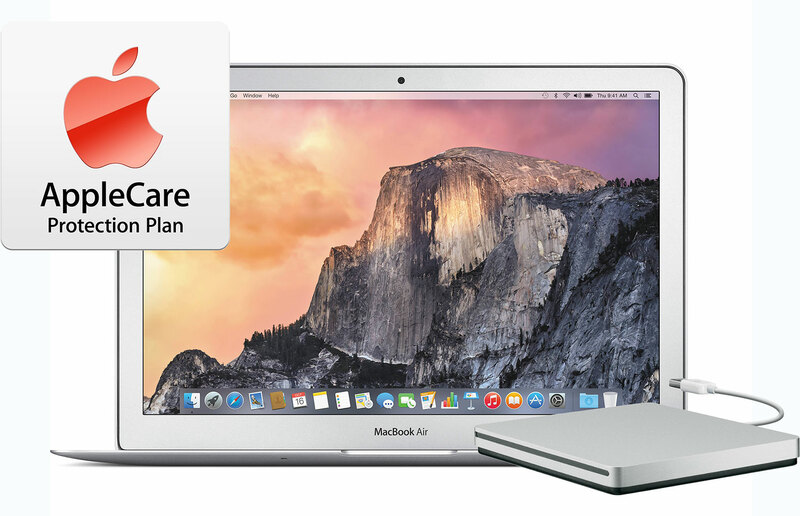 Lowest Prices Anywhere: For the next 6 days, grab a Free AppleSuper Drive plus 25% to 100% off AppleCare extended protection plans on all of Apple's latest 13- &15-inch MacBook Airs and MacBook Pros. Plus free shipping and no sales tax in 48 states. 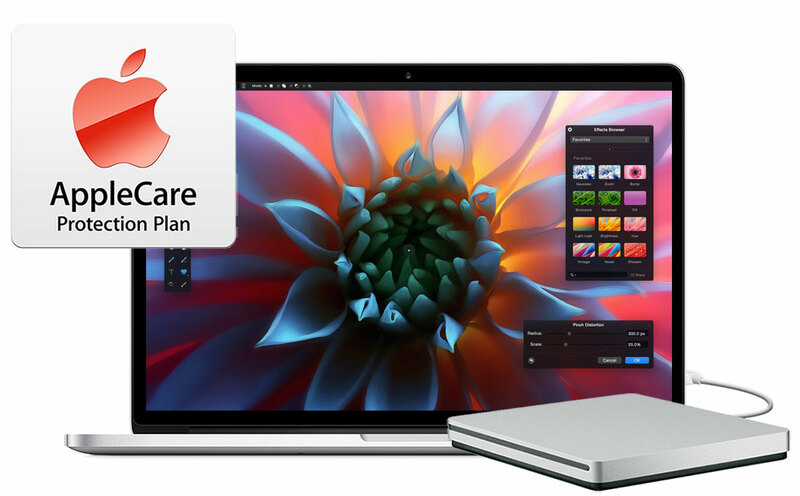 As we announced this weekend, AppleInsider has teamed up with Apple authorized reseller Adorama to offer a Free Apple SuperDrive & Free AppleCare on several Mid-2015 15" MacBook Pros, as well as a Free Apple SuperDrive & 50% off AppleCare on several Early-2015 13" MacBook Pros & MacBook Airs. But more generally, these two promotions combine to offer readers a Free Apple SuperDrive and between 25% and 100% off AppleCare on every possible 2015 13" MacBook Air, 13" MacBook Pro and 15" MacBook Pro. 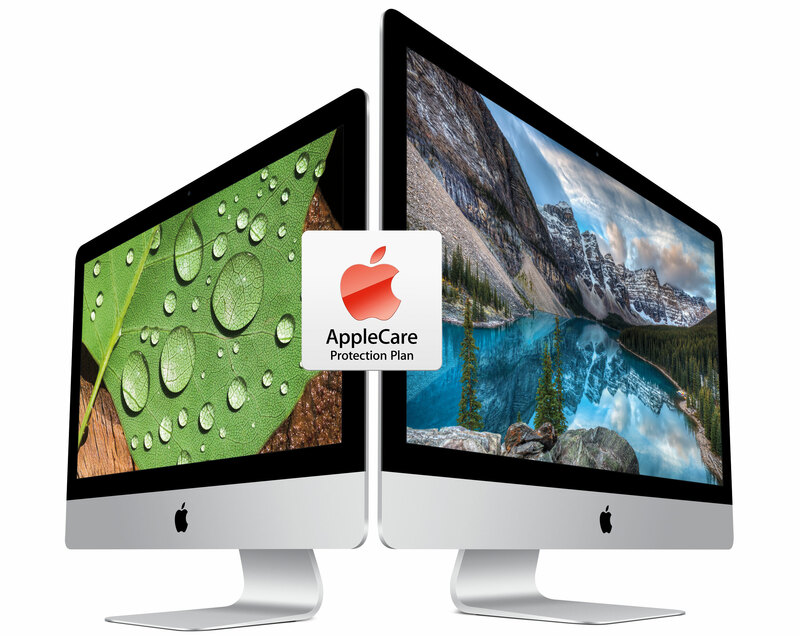 In most cases, the final net price of these bundles deliver the lowest prices anywhere for the Mac paired only with the AppleCare, meaning the SuperDrive and any additional additional cash discounts between the next lowest price listed in our Macs with AppleCare Price Guide are both sweeteners to the deal. Plus Adorama will only collect sales tax on your order if you live in NY or NJ. In total, most shoppers will save between $250-$600 with all the benefits of these deals when compared to buying at an Apple Store. The key to these promos are our exclusive bundles paired with promo code APINSIDER, which will deduct at least $100 off Adorama's advertised price for the bundles after you first click through the Adorama links on AppleInsider or the Price Guides to activate the promo code. You can check out the highlights from these offers below, along with step-by-step instructions for making sure you get the lowest advertised price. Offers expire 11/16/2015. 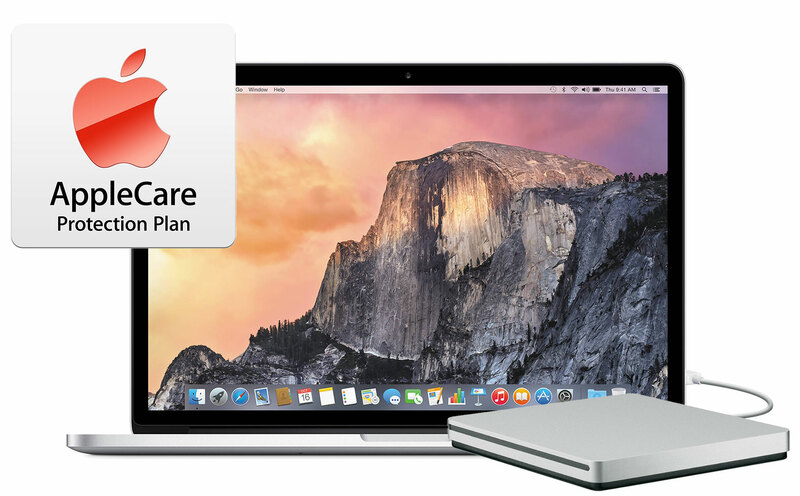 Don't Care About SuperDrives or AppleCare, Just the Lowest Commitment Price? Meanwhile, shoppers who don't care for AppleCare or a SuperDrive can instead use the Adorama links in our regular Mac Price Guide and the same APINSIDER promo code to knock an additional $50 off every 13" and 15" MacBook (2015 models), delivering the lowest net purchase prices anywhere for all of Apple's current MacBooks. Shoppers on tight budgets should also consider one of the remaining 2014 13" and 15" MacBook Airs and MacBook Pros that are extremely similar to this year's models but discounted by up to $600 until supplies run out. The following bundles all include one of Apple's new early-2015 13" MacBook Pros, 3 Years of AppleCare extended protection ($249 value), and an official Apple SuperDrive ($79 value), plus free shipping and no sales tax collected if you live outside NY and NJ (another $100-$200 off). In total, shoppers outside NY & NJ should see total savings of $200-$400 when compared to buying from am Apple store. Included in this offer are all 3 of Apple's standard retail configurations MF839LL/A, MF840LL/A, and MF841LL/A. which are the first 3 configurations listed below, respectively. The discounts in red are the savings compared to Apple's prices for just the MacBook Pro with AppleCare. It does not include the $79 savings from the free SuperDrive or any tax savings, which would be in addition. Please follow the step-by-step instructions at the end of this article to apply the appropriate coupon codes during checkout. 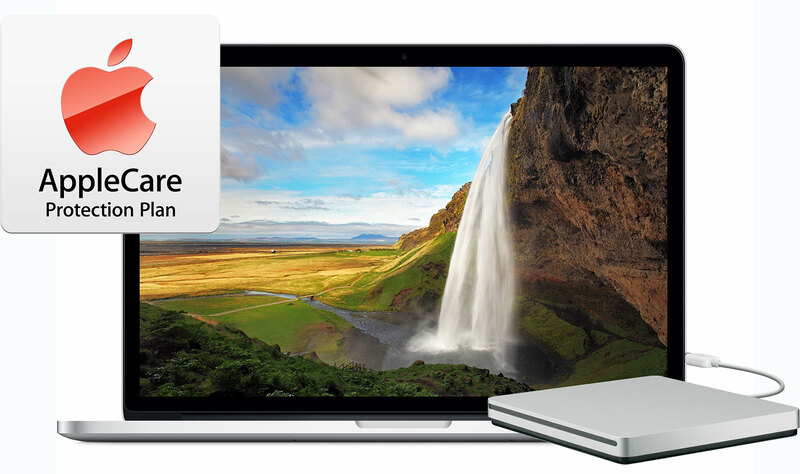 % Exclusive AppleInsider reader price when applying $100 promo code APINSIDER during checkout. The discounts in red do not factor in the $79 savings from the free Super Drive, which is an additional savings. The following bundles all include one of Apple's early-2015 13" MacBook Airs, 3 Years of AppleCare extended protection ($249 value), and an official Apple SuperDrive ($79 value), plus free shipping and no sales tax collected if you live outside NY and NJ (another $90-$150 off). In total, shoppers outside NY & NJ should see total savings of $150-$275 when compared to buying from am Apple store. Included in this offer are both of Apple's standard 13" MacBook Air retail configurations MJVE2LL/A and MJVG2LL/A, which are the first 2 configurations listed below, respectively. The discounts in red are the savings compared to Apple's prices for just the MacBook Air with AppleCare. It does not include the $79 savings from the free SuperDrive or any tax savings, which would be in addition. Please follow the step-by-step instructions below to apply the appropriate coupon codes during checkout. 4) Once logged in, select your mid-2015 13" MacBook + AppleCare + SuperDrive bundle by clicking one of the pricing links in the article above (or those in the Macs with AppleCare Price Guide) —you must use these links! 5) When the Adorama 13" MacBook page loads, you'll see a price that's roughly $100 higher than advertised. 8) After you apply the promo code, the total price should fall by roughly $100 to match the prices advertised. The following bundles all include one of Apple's new mid-2015 15" MacBook Pros, 3 Years of AppleCare extended protection ($349 value), and an official Apple SuperDrive ($79 value), plus additional cash discounts —all of which yield the lowest prices anywhere for these MacBook Pros, plus free shipping and no sales tax collected if you live outside NY and NJ (another ~$200 off). In total, shoppers outside NY & NJ should see total savings of $400-$600. Included in this offer is both of Apple's standard retail configurations MJLQ2LL/A and MJLT2LL/A, which are the 1st and 4th models listed immediately below. The discounts in red are the savings compared to Apple's prices for just the MacBook Pro with AppleCare. It does not include the $79 savings from the free SuperDrive or any tax savings, which would be in addition. Please follow the step-by-step instructions below to apply the appropriate coupon codes during checkout and take note of this $100 AppleCare rebate. 4) Once logged in, select your mid-2015 15" MacBook Pro + AppleCare + SuperDrive bundle by clicking one of the pricing links in the article above (or those in the Macs with AppleCare Price Guide) —you must use these links!